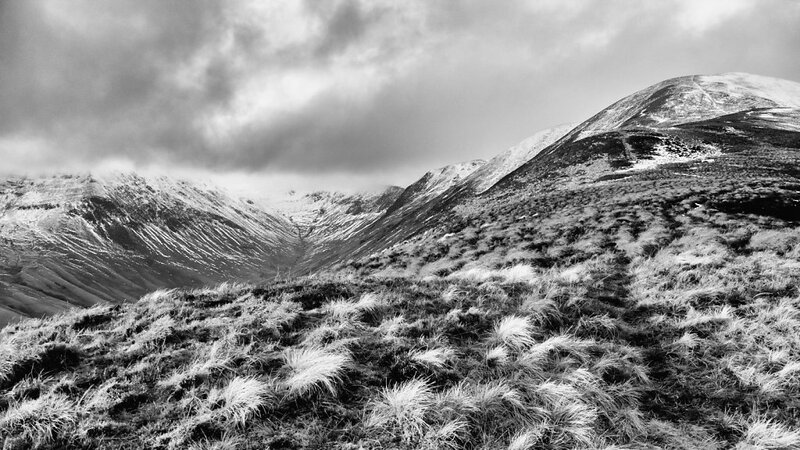 The Southern Uplands of Scotland exhibit a surprising variety of forms from broad-topped rolling moorland hills to steep-sided craggy mountains. The Moffat and Tweedsmuir Hills are the bulkiest group with the most high ground and peaks rising to 840 metres. The Lowthers are less lofty but they're characterful and criss-crossed by passes and deep valleys. 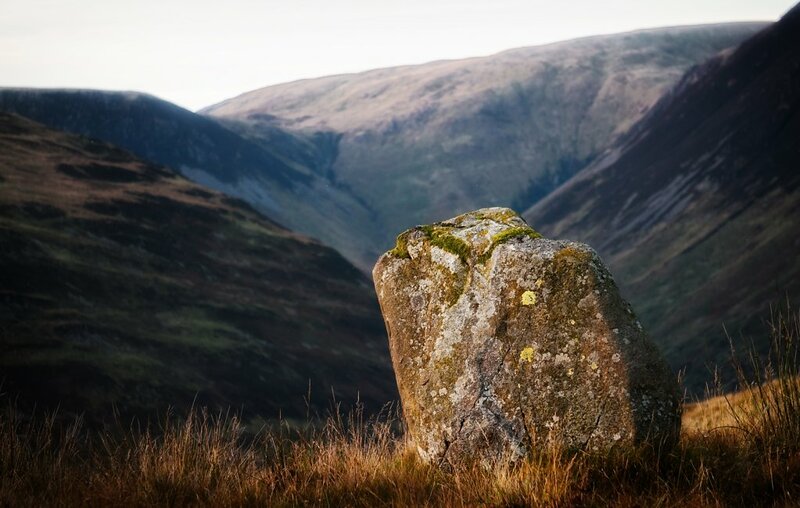 The Galloway Hills boast the Merrick, at 843 m, the highest hill in the south of Scotland and a range with more of the characteristics of Highland peaks, being granite cored and liberally adorned with lochs at their feet. 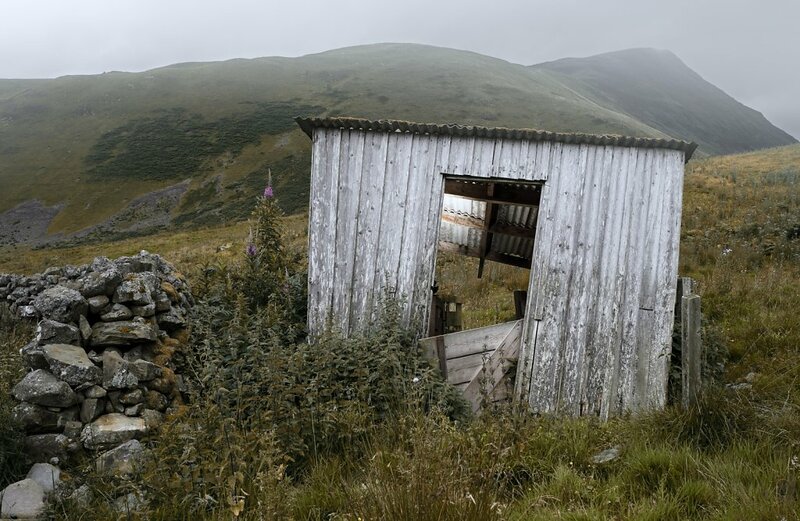 No matter where you roam amongst the Southern Uplands though, you'll always find solitude because these hills don't attract the hordes of Munro baggers and Wainwright tickers that the Scottish Highlands and English Lake District tops always do. A view from the slopes of Saddle Yoke in January. 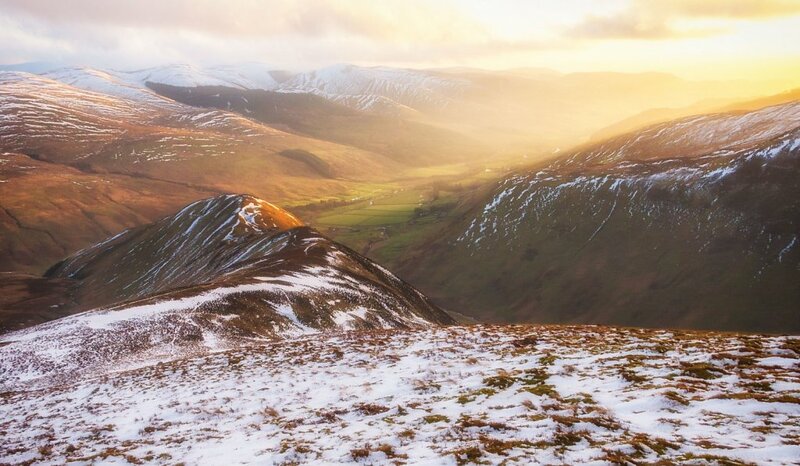 Winter light can make walking across the tops a surreal experience. 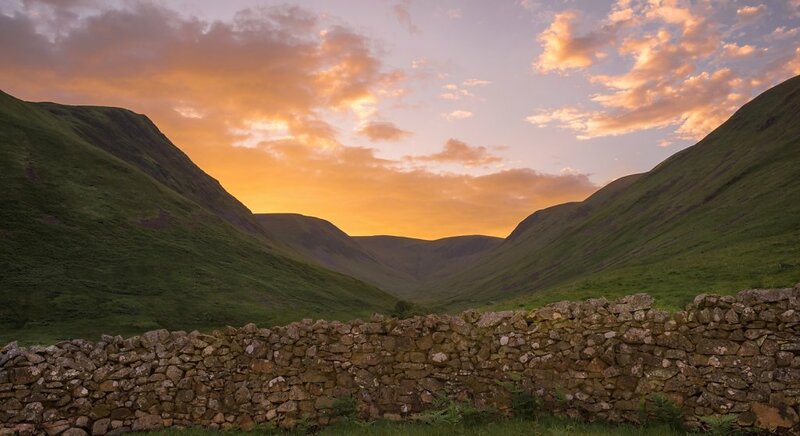 A summer scene in the bonny glen that runs southeast from Hart Fell. Swatte Fell rising left, and the Saddle Yokes rising right. 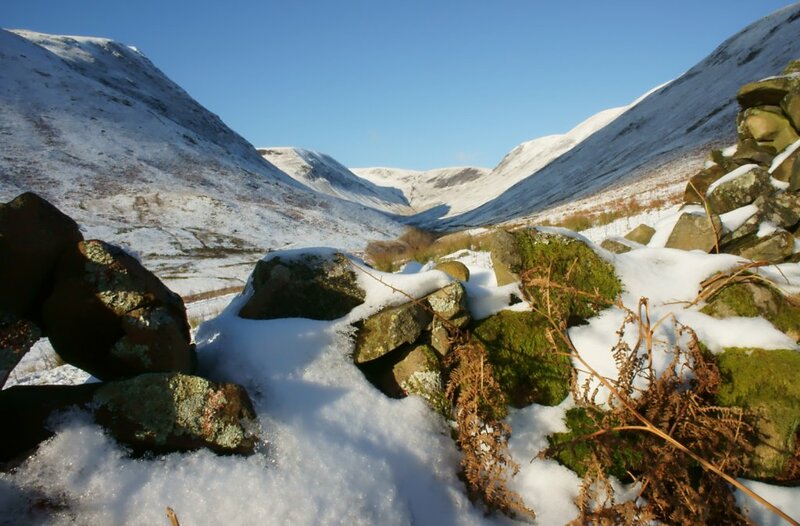 The Blackhope glen below Hart Fell runs two miles SE before it meets Moffat Dale at Capplegill. The cloud far below us was funnelling over the Megget Stone. The dammed loch of Talla was built for the 'Edinburgh Water Company' at the end of the 19th Century. Part of the Clyde wind farm north of Moffat. 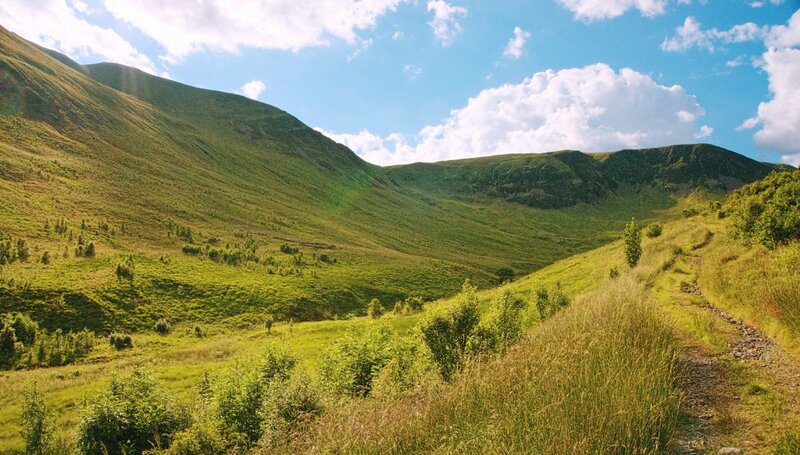 Areas of the Southern Uplands that had been given over to blanket forestry are being used for power generation. 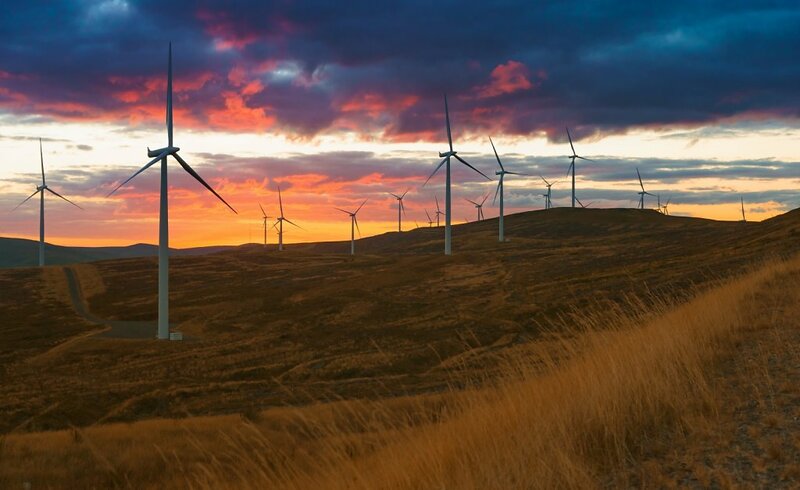 Estate owners are increasingly turning their gaze to build turbines on more open, recreational use land. 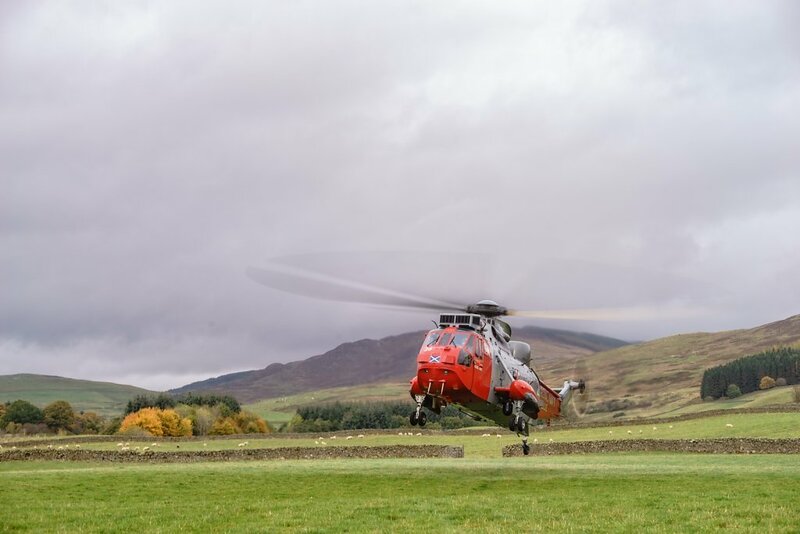 The Moffat MRT leaving town on an exercise. 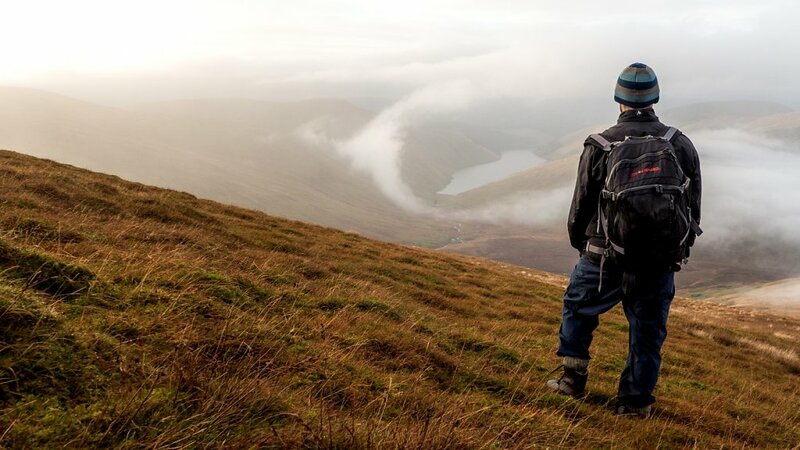 Seen from the Southern Upland Way, Scotland's longest long distance path and a coast to coast route. 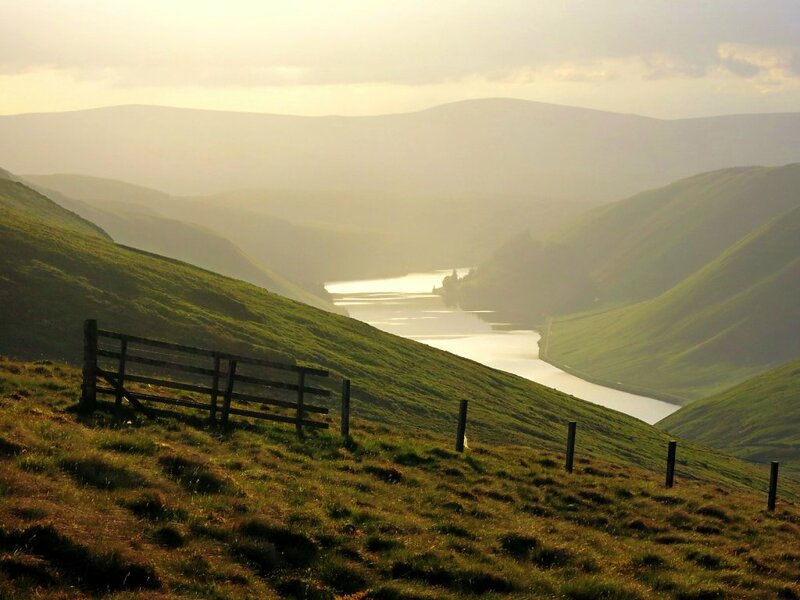 The Loch of the Lowes and St Marys Loch are at the head of the Yarrow which runs to Selkirk, merges with the Ettrick and joins the Tweed a few miles later. 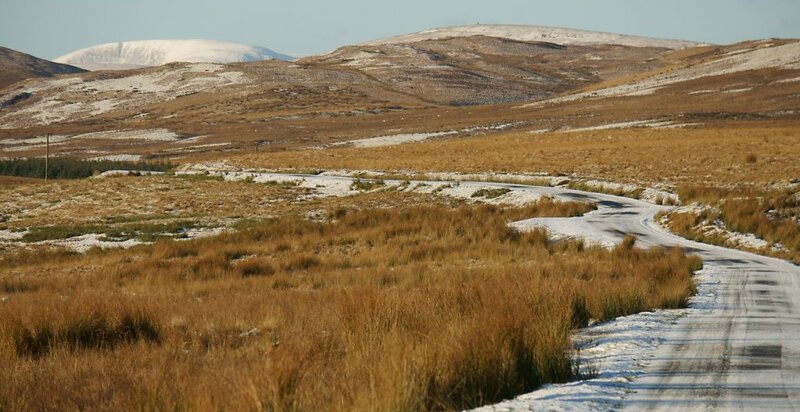 In Dumfriesshire, between the Esk and Yarrow glens, Ettrick Pen wears its winter coat with pride. Rolling moorland at the top of the Dalveen Pass, not far from Abington. 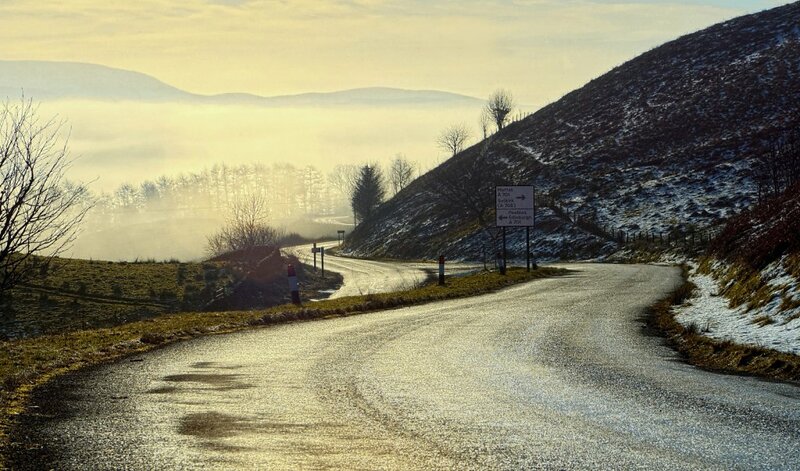 At the junction of Greenhillstairs and the A701 Edinburgh road, mist cloaks the glen below. 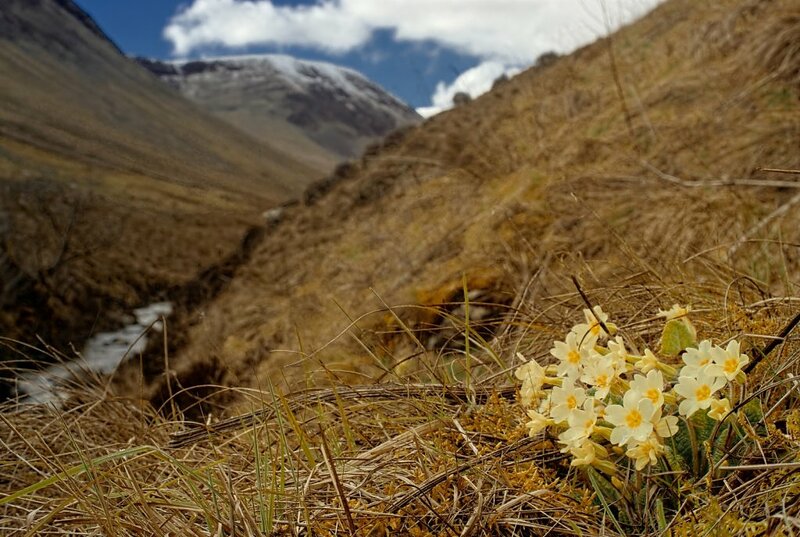 Primroses herald a new season in the Moffat Hills. 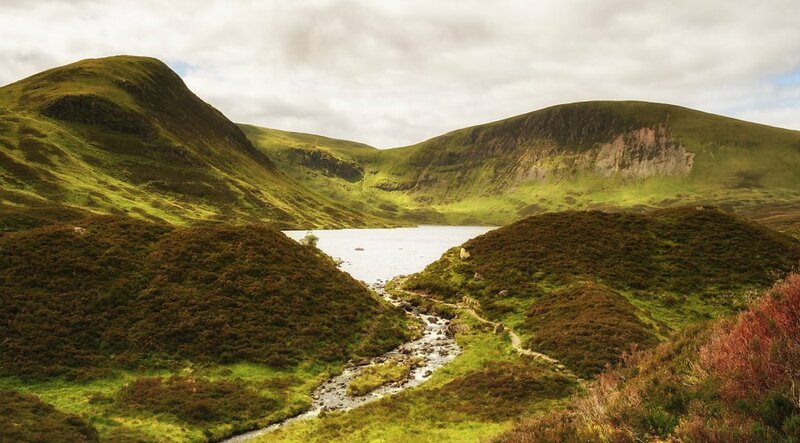 A glacier carved landscape, the loch is seen from the Tail Burn which threads its way between drumlins before tumbling off this hanging valley via the Grey Mare's Tail waterfall. 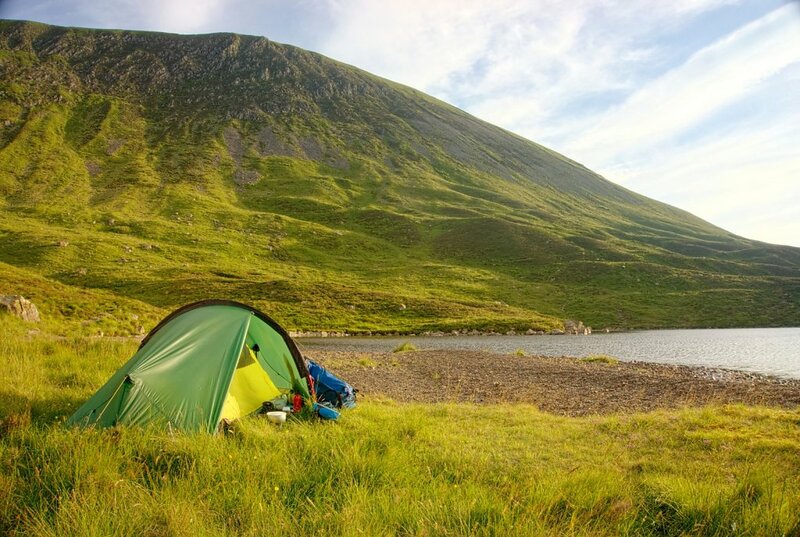 Preparing breakfast after an overnight camp at Loch Skeen before the walk back to Moffat. 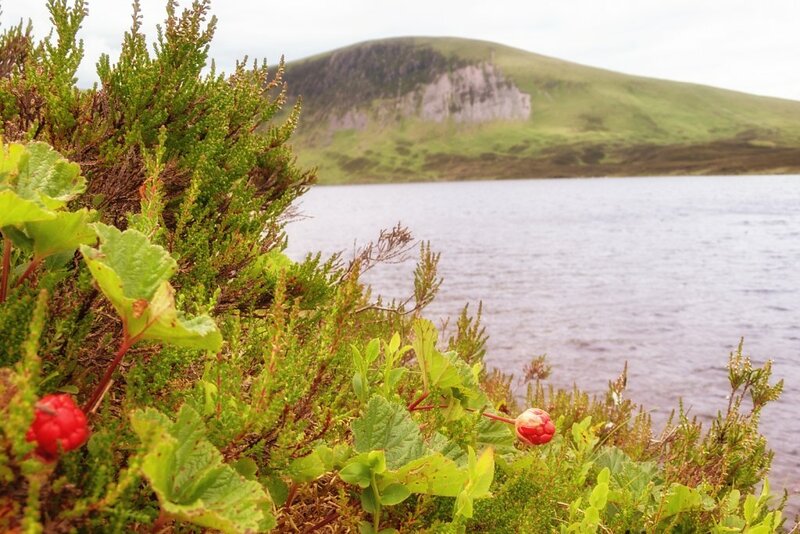 Cloudberries are common in the Moffat Hills but they are very rare in the UK growing elsewhere only in the Cairngorms. They are hard and bitter when red but ripen yellow-orange to a soft, creamy, delicately flavoured sweet berry. They are considered a delicacy in Scandinavia where they are eaten fresh as I eat mine, or preserved as a jelly. An early winter view towards the loch and some of the hills that surround it. 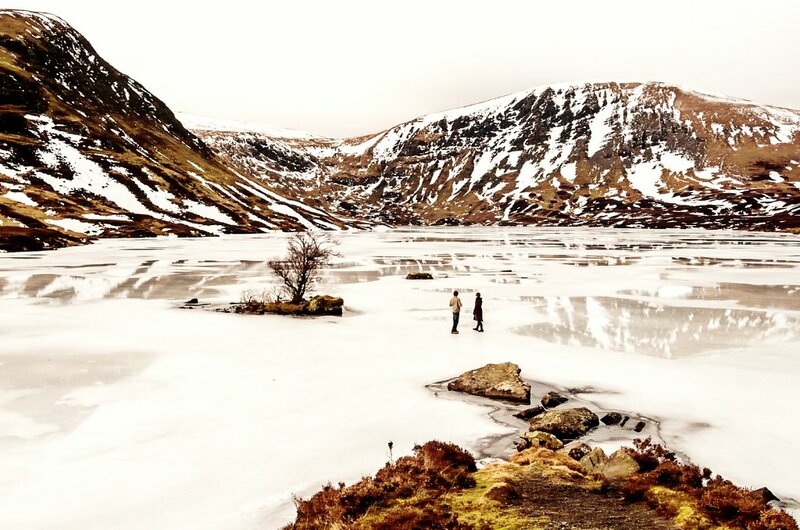 I caught this bizarre scene on Loch Skeen near Moffat where two walkers dressed as if they were Christmas shopping in Sauciehall Street wandered out towards an island. 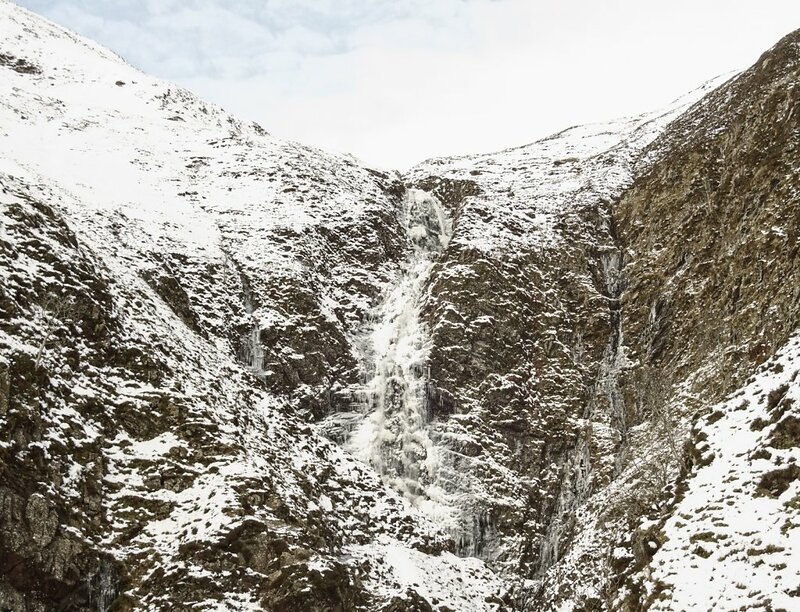 On of the UK's highest drop waterfalls is located close to Moffat and when it freezes, it draws winter climbers from all over the UK to tackle its ice. 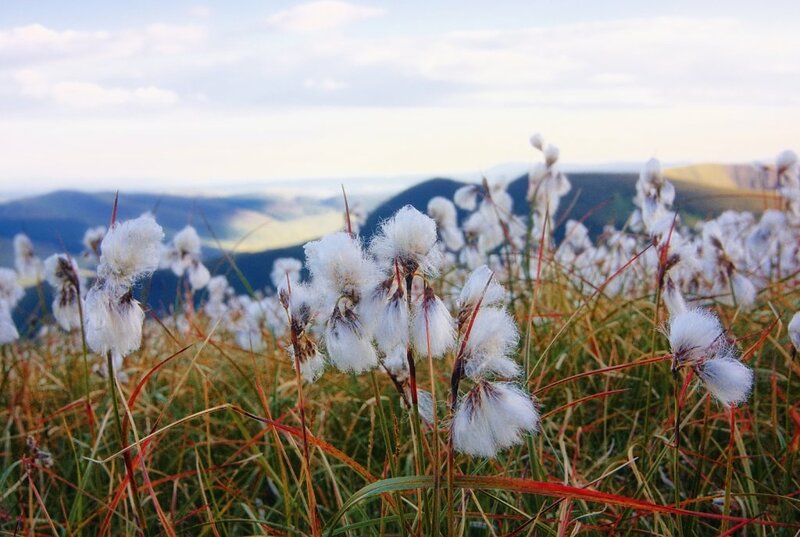 Late summer in a Moffat Hills glen. Early winter snow on the haul to the summit. 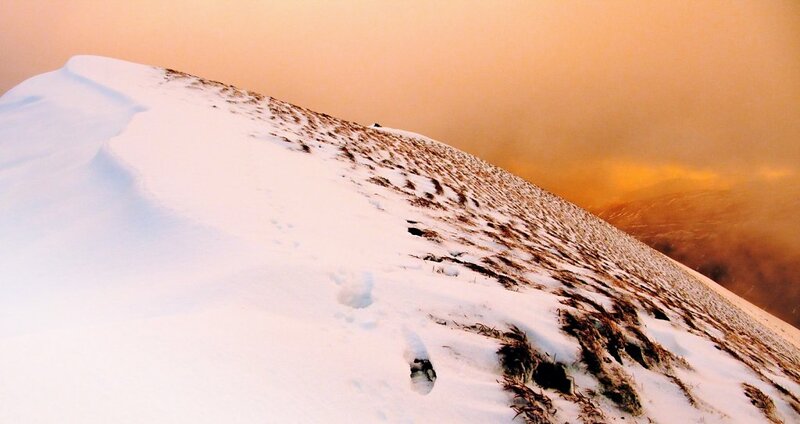 The north and east facing corries of the higher Moffat Hills retain snow into early summer.This snow lasted until June. The curious distortion of a circle when you're at its perimeter ! 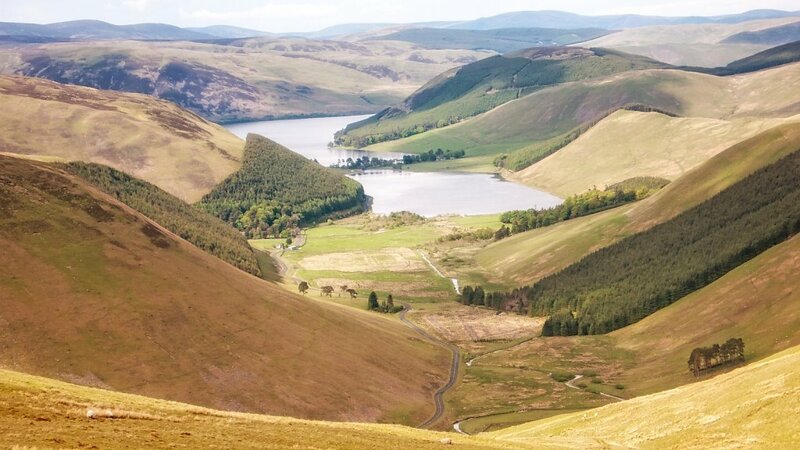 The view encompasses Blackhope Glen, the Ettrick Hills and Moffat Dale. The snow lie on northern and eastern vs southern and western flanks is stark. Loch Skeen seen from the cornice along Mid Craig. Lochcraig Head (801m) is centre left and the big wadge of snow on the left horizon is on Firthybrig Head. I estimated the drift depth there at 5 metres+, and some of the drifts on White Coomb appeared to be much deeper. Loch Skeen from the southern end, close to the tail burn. I was convinced I could hear a helicopter at one point but as I turned a corner, I heard splashing as the cacophony of fruity frogs making the noise dived away.